Nowhere is the power of women in early England more evident than in the number of canonised royal abbesses. Among the Wuffings we have the daughters of Rædwald’s nephew, King Anna. 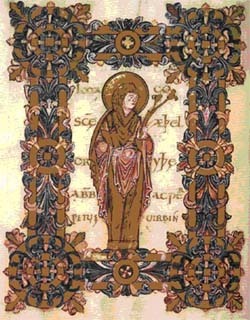 These include the famous St Æthelthryth, founding abbess of Ely, St Seaxburh, queen of Kent and founding abbess of Minster on Sheppey, and St Wihtburh, Abbess of Dereham. Finally, we shall consider the extraordinary story of St Balthild, a lady of apparently English, possibly even East Anglian, noble family, who was captured by Franks and sold as a slave, but who later became a princess, queen, abbess and saint.